As the victims of this morning's massacre at a Jerusalem synagogue are laid to rest, more details emerge of the horrific killing-spree. As the four victims of this morning's massacre at the Kehillat Bnai Torah Yeshiva Synagogue in Jerusalem's Har Nof neighborhood were laid to rest Tuesday afternoon, Israelis are still in shock at the depravity of the attack on unarmed worshipers as they prayed. The four victims - Rabbi Moshe Twersky, Rabbi Kalman Levine, Aryeh Kupinsky, and Avraham Shmuel Goldberg, hy"d - leave behind grieving widows and 24 orphans between them. Terrorists Ghassan and Uday Jamal stormed the synagogue early Tuesday morning armed with knives, a meat cleaver and a pistol, inflicting horrific wounds on their victims, which also included eight injured - four of them seriously. The terrorists were finally killed in a shootout with police. More and more details are now emerging from eyewitness accounts and photographs from the scene of the slaughter. 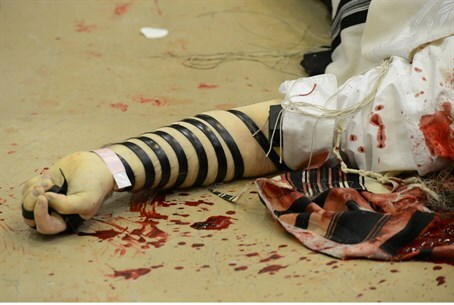 Israel's government press office has released shocking pictures from the immediate aftermath, showing murdered worshipers still draped in their prayer shawls and wearing tefillin (phylacteries). "One of the worshipers came out full of blood, and said: there was a massacre," a witness told IDF Radio. "Police took only 11 minutes to arrive and paramedics arrived five minutes later." Sarah Abrahams, a horrified resident, described scenes of carnage. "I was going for a morning walk and passing by on the road above the synagogue," she said. "Someone told me not to go any closer and that there was something big going on, but I walked down to see. "There were people running from the synagogue, and a man sitting on the pavement covered in blood, it looked like he has been stabbed," she said. "The police were already there, and when one of the terrorists emerged from the synagogue they shot him on the steps. "Two people came out with their faces half missing, looking like they'd been attacked with knives." As she spoke, medics brought out four bodies one by one, each wrapped in white plastic, and loaded them gently into ambulances. Grisly images from inside the synagogue showed prayer books and traditional white prayer shawls drenched in blood, and a wide arc of blood splattered across walls and bookshelves. Fighting back tears, Moshe Eliezer said he had narrowly avoided being at the scene after oversleeping. "This is a yeshiva community. Ninety percent don't serve in the army. We're not violent," he said. Moti Bukchi who went inside to help the wounded described scenes of horror. "The scene inside was harrowing, with a lot of blood," he told AFP. "Inside the synagogue some people were wounded by gunshots, others had chopped off limbs caused by a meat cleaver," he said. "We have seen things here for the first time - a man goes in with a meat cleaver and starts to attack people and chop off their limbs? That is something new." Another emergency worker and local resident, Eli Pollak, described what he saw as "one of the cruelest scenes I have ever witnessed." Speaking to Arutz Sheva, Yehuda Meshi-Zahav said what he saw resembled images from the holocaust. "I don't remember seeing a disaster scene as shocking as this, (the victims) were wrapped in talit (prayer shawls) and tefilin (phylacteries)," he said, describing "puddles, rivers of blood throughout the entire synagogue, siddurim (prayer books) thrown all over the floor - a sight that we only recognize from the Holocaust, from the period of the Holocaust." "These are Jews who got up early in the morning to pray to the Creator of the World, and in the middle of their prayers - in the middle of a religious act, of an act of faith, not of conflict - were attacked...I do not know what ismore shocking than this." Meanwhile, Palestinians celebrated the massacre. In Gaza and Bethlehem revelers handed out candies and celebrated with passersby, while in the Jerusalem neighborhood of Jabel Mukhaber, where the two terrorists behind the attack lived, family members gleefully celebrated their "martyrdom." "We responded with shouts of joy when we received the news about their deaths," Ala'a Abu Jamal said of his cousins Ghassan and Uday Abu Jamal to Yedioth Aharonoth. "People here distributed candies to guests who visited us, and there was joy for the martyrs." The party didn't last long for the Abu Jamal's though; police raided the neighborhood and arrested 12 people, including several family members. Meanwhile, Israeli Prime Minister Binyamin Netanyahu has ordered the demolition of the terrorists' homes, and Interior Minister Gilad Erdan announced he will be expelling the wife of one of the killers from Jerusalem.